​Click on images to enlarge (c) Gilly Pickup. Compact, pristine Salzburg is one of Europe's finest baroque cities. Once capital of an independent country ruled by the powerful prince-archbishops, it offers an inspiring mixture of grand city scape and mountain views and is dripping with history to boot. So much so, in fact, that the Old City was listed by UNESCO as a World Heritage Site in 1997. Its blast-from-the-past cobbled streets and narrow alleyways lined with ice cream coloured houses, elegant shops and restaurants, combine with an unhurried pace of life make it an ideal destination for a relaxing city break at any time of year. 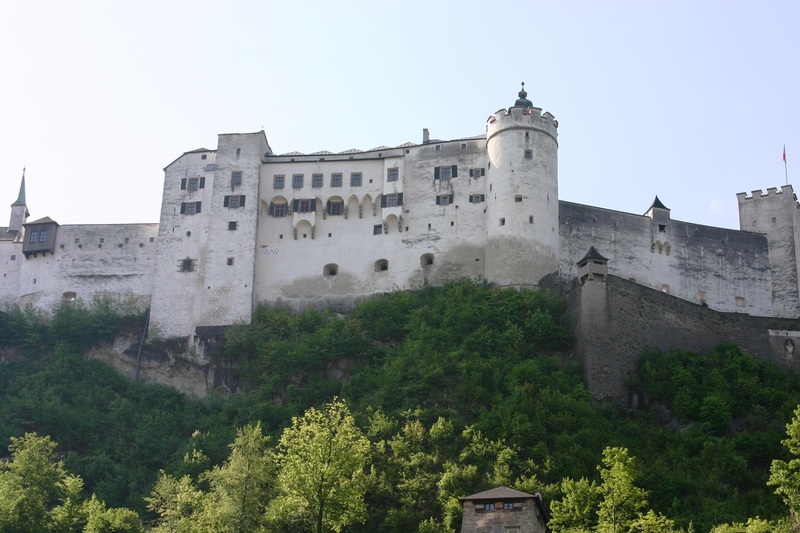 The 11th-century Hohensalzburg fortress was once home to the prince-archbishops. This mighty medieval castle is Central Europe's largest unconquered fortification. 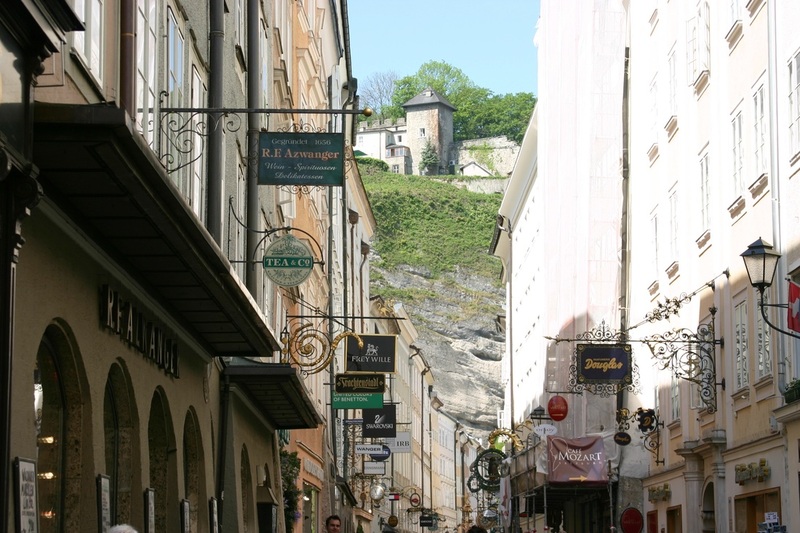 Take the funicular to the top for spectacular views over the city and Salzach river, which splits the city in two. Guided tours are available year-round. 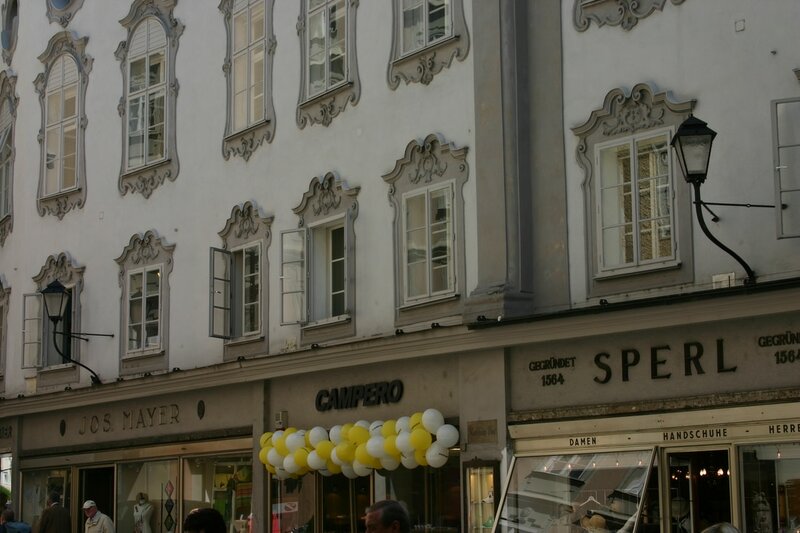 The Mozart family lived at Getreidegasse 9 for 26 years and this was the celebrated composer's birthplace. The home of the boy genius, who was able to read, play and compose music by the time he was five, is now a museum where visitors can marvel over his violin, harpsichord, piano and letters from the Mozart family. A word of warning: it gets very crowded during high season. Hellbrunn Palace is an architectural masterpiece just south of the city, where you can see mystical grottoes, trick fountains, a miniature mechanical theatre with 141 moving figures, and a folklore museum. Kids love to make merry in the gardens, too. For The Sound of Music fans, this is where to see the pavilion where Liesl and Franz first met. Kirchtag Umbrella Shop in Getreidegasse. This family business produces hand-made top quality umbrellas and parasols. They also make bags, gloves and walking canes – obviously suited to those with a touch of the dandy. Inside the shop is a 1,000-year-old wall, uncovered during routine maintenance work. Sporer Wines and Spirits is a shop, bar and all-round convivial place. You’ll find this small, always busy, third-generation family business in the narrowest house in the Getreidegasse, next door to the hotel Blaue Gans. 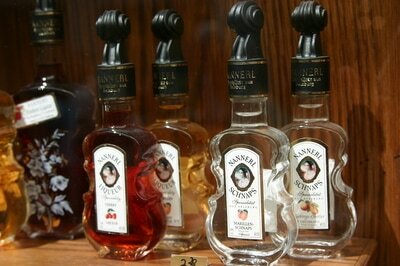 It offers a large selection of liqueurs and schnapps, which can be sampled by the glass or purchased by the bottle. The ‘House Blend’ is a glorious herbal liqueur, while their orange punch is still made according to granny’s original 1927 recipe. Jolly good it is, too. 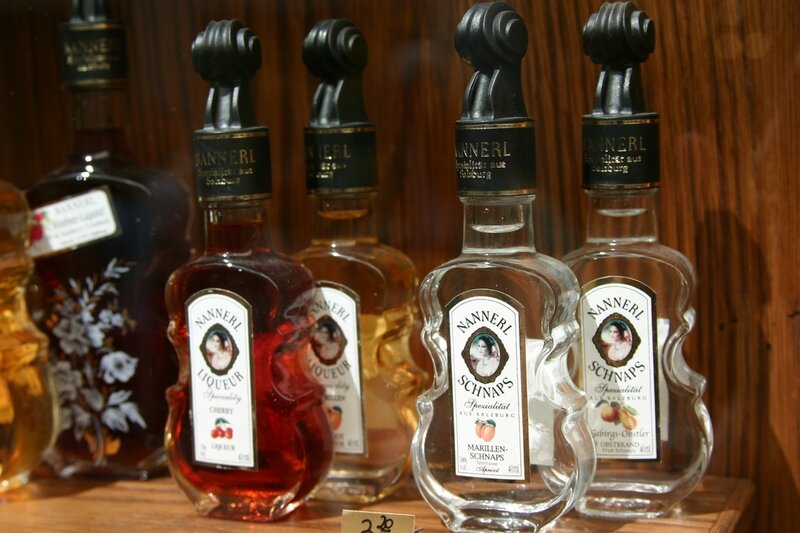 A bottle of in-house-produced schnapps is a great present to take home. Tailor Jahn-Markl, located in the Residenzplatz, has been making traditional suede and goatskin lederhosen since 1408. 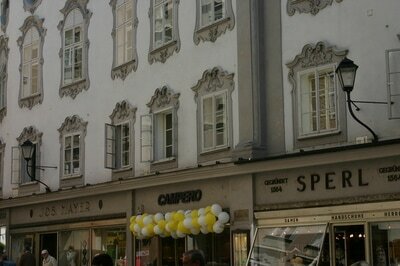 This is another family-run business and Salzburg's oldest tannery. They also produce dirndls, hand-knitted socks and jackets. Look no further than Café Tomaselli on the Alter Markt, all wood panelling, marble tables, silver trays and tuxedo-clad waiters. Founded in 1705, it is Austria’s original ‘Viennese coffee house’. Throughout the centuries, it has been a popular meeting place for the movers and shakers of the day, including Wolfgang Amadeus Mozart. Besides its popular balcony, there is an atmospheric garden lined with shady chestnut trees. 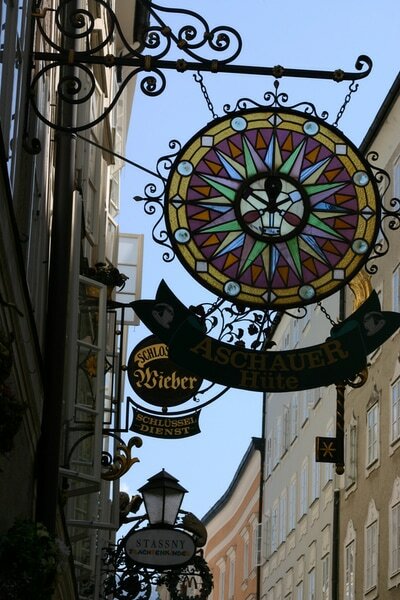 Try the Sternbräu at Griesgasse 23-25, a grand old building dating from the mid-13th century. On a fine day sit in the beer garden and people-watch while enjoying a sturdy lunch. How about traditional beef goulash with beer cream sauce, white bread dumplings and salad or a mixed plate of ham (boiled ham, prosciutto, smoked ham, bread and butter) . Fish fans might prefer broiled char with rosemary butter, almonds and salted potatoes. The sweet-toothed will be in seventh heaven - try the original apfelstrudel with cream or the 'Salzburger Nockerl' (Salzburg-style soufflé). Children are made welcome and there is a playroom and baby-care room on the first floor as well as a playground in the inner courtyard. The kids' menu is sure to please small fry, with choices like chicken kebabs with chips and ketchup or chocolate pancakes. Döllerer, located just outside Salzburg in the village of Golling, is a Michelin-starred restaurant. Run by an extended family, this is somewhere to give your tastebuds a treat. The menu includes delights such as basted alpine salmon with marinated asparagus and wild garlic cream and goulash with dumpling, cucumber, sausages and fried egg. The desserts are rather moreish too. The Blaue Gans is the oldest inn in town – 650 years old to be exact. It has an enviable location on Getreidegasse, Salzburg’s main street, so is handy for most city attractions. It has been transformed into a 21st-century art hotel, with contemporary sculpture, photography and paintings. Individually designed rooms are crisp, spotless and comfortable. The restaurant serves both traditional and modern fare.